PHOTOS: Zendaya Receives The Young Luminary Award At The 2015 unite4:humanity Gala! Zendaya looked chic in a white two piece outfit for the 2015 unite4:humanity Gala held on Thursday (February 19) at the Beverly Hilton Hotel in Beverly Hills, California. Zendaya stepped on stage to receive the unite4:humanity Young Luminary Award in recognition of her philanthropic work. The award was presented by Demi Lovato. Be sure to check out more pics of Zendaya from the Gala in the gallery below! PHOTOS: Demi Lovato Speaks Onstage At The 2nd Annual unite4:humanity! Demi Lovato looked stunning in red as she attended the 2015 unite4:humanity Gala held Thursday (February 19) at the Beverly Hilton Hotel in Beverly Hills, California. According to the foundation’s website, the event was held to recognize and honor the entertainment industry’s brightest stars from the worlds of film, television and music for their philanthropic commitment. Demi was one of the few presenters to present the unite4:humanity Young Luminary Award to Zendaya! Be sure to check out more pics of Demi from the Gala in the gallery below! PHOTOS: Taylor Swift At The Pre-Grammy Gala and Salute To Industry Icons! Taylor Swift attends the Pre-Grammy Gala and Salute To Industry Icons honoring Martin Bandier last night (February 7) at The Beverly Hilton Hotel on in Beverly Hills, California just one day before the 2015 Grammy Awards which air tonight (February 8). Be sure to check out more pics of Taylor from the event in the gallery below! Photos: Iggy Azalea And Taylor Swift Leaving Hotel! Singer Iggy Azalea is seen leaving the Beverly Hilton hotel with Singer and friend Taylor Swift yesterday February 7th in Beverly Hills, California. Photos: Juliette Lewis Leaving A Salon In Beverly Hills! Actress Juliette Lewis waves to the cameras while leaving a salon in Beverly Hills, California yesterday with friends on February 6, 2015. Juliette has been busy of late working on her new ABC TV series ‘Secrets & Lies’ which co-stars Ryan Phillippe. Photos: Brandy Norwood Is All Smiles In Beverly Hills! Singer and actress Brandy Norwood is all smiles while out and about on February 6, 2015 in Beverly Hills, California. Brandy has taken a break from her singing career and has been enjoying her time away from the spotlight. Hilary Duff Takes A Day Out — Pics Here! Hilary Duff had a day out was spotted out and about by herself, then later with her son Luca to catch some lunch in Beverly Hills, California yesterday, January 26th. Justin Bieber Hides His Face From Cameras In Beverly Hills! Pics Here! 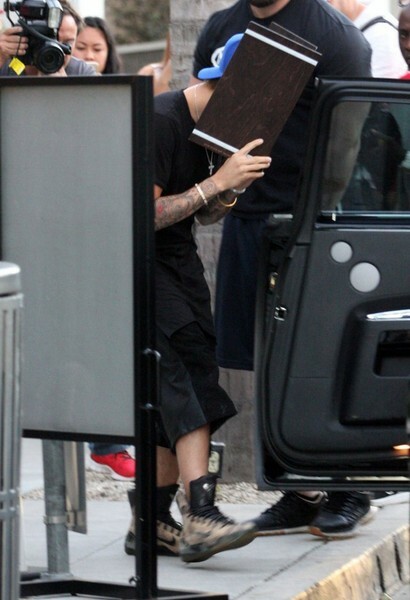 Singer Justin Bieber seen using a menu to hide his face as he rushes to his car after having lunch at Spago on January 24th in Beverly Hills, California. Justin dyed his hair back to brown after rocking the platinum blonde hair for a couple of weeks.